Goodreads says, "Their passionate encounter happened long ago by whatever measurement Claire Randall took. Two decades before, she had traveled back in time and into the arms of a gallant eighteenth-century Scot named Jamie Fraser. Then she returned to her own century to bear his child, believing him dead in the tragic battle of Culloden. Yet his memory has never lessened its hold on her... and her body still cries out for him in her dreams. Then Claire discovers that Jamie survived. Torn between returning to him and staying with their daughter in her own era, Claire must choose her destiny. And as time and space come full circle, she must find the courage to face the passion and pain awaiting her...the deadly intrigues raging in a divided Scotland... and the daring voyage into the dark unknown that can reunite or forever doom her timeless love." Claire Randall thought the love of her life, Jamie Fraser, was dead at the battle of Culloden, like most of his comrades. However, she finds out through some research that he actually isn't dead and somehow survived. Now that she has this life-altering information, she wants to travel back in time through the stones to be reunited with him, but there are so many unknowns. Will he still be unmarried and want to see her? What about their daughter? Even though she is a grown woman now, can Claire really leave her behind? With Frank dead and her job on hold, now is Claire's chance; plus, her daughter knows the truth now. What Claire Fraser finds when she travels back is an edge-of-your-seat adventure and love story. 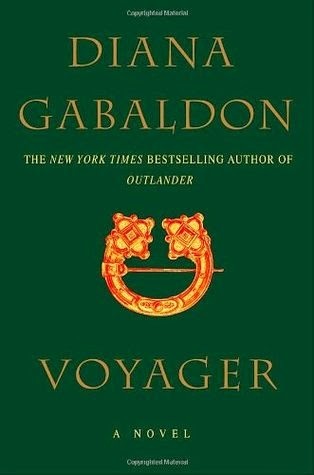 Gabaldon definitely weaves her magic in Voyager, the third book of the Outlander series, and fans will be pleased. What I love so much about Claire is the fact that she is a modern woman living in a time when women weren't so independent. She is now a doctor and raised her daughter well. Frank has died, so now is her time to travel back to Jamie once she finds out he is indeed alive. Of course leaving it all behind after so many years is tough, especially for the simple fact that she has no clue what she is in for when she goes through the stones, but I love her courage in Voyager. Once she does go back, she is faced with many obstacles and hardships, but faces them all with her usual courage and determination. Simply put, she is one of my favorite heroines. Readers get more of a glimpse into Jamie's life in Voyager. I liked that Gabaldon gave us a heads up as to what has been going on with Jamie while separated from Claire. In usual Jamie fashion, I can't say I entirely agree with his every move and decision, but nonetheless, I still am still a huge fan of him. Jamie finds himself in more than one uncomfortable situation, but the fact of the matter is, he has never stopped loving Claire. Oh, the adventure in Voyager!! The other books in the series have a lot of adventure in them, but I feel like there were a lot of instances of major adventure and travel in Voyager. I really enjoyed this aspect of the story, but some situations weren't as believable for me as they were in Outlander. They seemed a bit too coincidental, but nonetheless, I was still completely absorbed in this story. And I feel like since Gabaldon's books are so lengthy, that inevitably there will be slow spots and I feel like this was true in Voyager as well. Sometimes Gabaldon can get overly descriptive and wordy, but that is really my only major issue with this series. All in all, I am LOVING the Outlander series and I can't wait to continue with book four, Drums of Autumn. Things are really starting to heat up and I wonder how on earth Gabaldon can keep it up, but she is such a master storyteller, I have no doubt she will keep me entertained for many books to come. I'm not sure I can handle this series Christina! So much happens to Jaime and Claire and I want nothing more than for them to be happy for ever and ever , but I know that's obviously not in the cards given how many enormous books are in this series. *sobs just thinking of them being separated* Can't wait to see what you think of the next book though! I know! It kills me to read about all of their trials and tribulations, but Gabaldon is such a fantastic storyteller…she makes it worth it! I'm glad you love Outlander as much as me, Jenny! Thanks for visiting! I loved Outlander and I liked this one. I think it is my second favorite of the four books I've read so far. Me too! I definitely enjoyed this one more than Dragonfly, but not as much as Outlander. I am looking forward to starting the 4th book! Thanks for visiting, Christina!